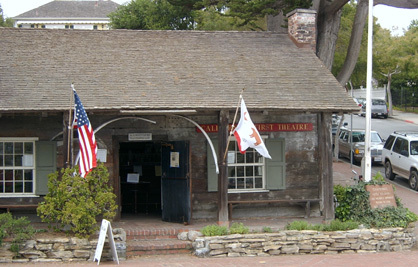 Located in Monterey State Historic Park, this adobe theater was built by Jack Swan in 1846-47 as a lodging house and tavern for sailors. It was used as a theatre in 1850 when U.S. Army officers from Colonel Stevenson's 1st New York Volunteers produced plays as a money-making venture. Swan built a small stage and provided benches, whale-oil lamps, candles for footlights, and curtains made of red and blue blankets. Tickets sold for $5 each. First night receipts totaled $500. In later years, the First Theatre was used as a lodging house for whalers but fell into disrepair after Swan's death in 1896. It was purchased in 1906 by California Historic Landmarks League and donated to the State of California. In 1937 and until recently, the Troupers of the Gold Coast staged the first melodramas since the 1850s. Due to structural deficiencies, California's First Theatre will be closed until further notice. For more information, please call Sector Superintendent Eric Abma at (831) 646-6441. Visit the Pacific House Museum or Custom House (located in the Custom House Plaza, near Fisherman's Wharf) to learn more about this historic building.